Live From Brownsville: Vineyard Music EXTRA! This album has done it again made me feel as though Im right where the action is when the Spirit is moving as His people worship Him in music! The familiar songs of worship are received by the people at Brownsville with joy and celebration, and it is impossible to not flow with the praise! Many of the songs are favorites already - something I really like with worship CDs, because when I already am familiar with many of the songs, its much easier to concentrate on the Fathers heart. 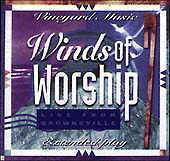 Being shut in with God, while having the sensation of being in a huge meeting with hundreds of other worshippers makes this another CD that must be in my collection. Mary Cassell <cassell@execulink.com> from Ontario, Canada, lives 2 hours from TACF and enjoys serving on the ministry team there!